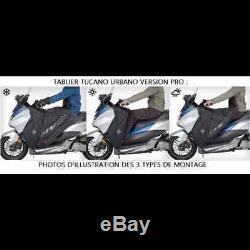 Protective apron tucano urbano new. For Yamaha 530 T-MAX / SX / DX Phase III. The evolution of the original termoscud® apron, equipped with the new 4 season system to extend the period of use of the apron; a heavy winter cover detachable in summer. During the winter season, it guarantees maximum thermal protection and prevents any high-speed floating thanks to the patented anti-floating inflatable system. Equipped with a new valve. Supplied to inflate with the mouth / a pump: makes the inflation hygienic and avoids the air exit during the closure of the valve. During the summer, there is no need to take off the scooter: just detach the winter part and keep only the rigid spoiler integrated into the body, from which you can extract an emergency rain cover and a practical saddle cover. Epi this 1st category (in 343: 2008). No more dismantling, reassembly and storage problems: a fixed part, a rain part, a winter part and a few seconds to go from one to the other. A bit like the system we have on 4-season jackets with their removable internal liners fixed with snaps or zips. We had to think about it: tucano urbano, always aware of functional innovation, proposes it to us. Winter version: we appreciate the inner jacket, lack of air entry, the little swirl of the apron due to inflatable soda bladders. The system has evolved with couplings allowing rapid deflation 1/4 turn and having a detachable inflation tip for better hygiene. The flanks go down low enough to protect the feet. Summer version: the dismounting of the winter part (internal jacket and the inflatable tubes) takes about ten seconds. Some pressure, two zips and it's gone. To store it, deflates the rolls by unscrewing a quarter turn the ends. And that does not take up space in the trunk. The upper rain part that is kept with the saddle extension at the end rolls in the fixed part of the apron of the scooter. It is maintained with three velcro straps and it can ride outdoors all summer. If rain occurs, the light apron is unfolded in 3 seconds and the vehicle is rolled dry, even when the passenger seat protection is retained. New, sold in original packaging. Suitable for yamaha t-max 530 / sx / dx from 2017. Exterior in 1680 ballistic and dobby polyamide resistant and waterproof. Anti-theft ring (only on non-screwed models). Saddle cover stored in the chest pocket, also available in the summer version. Smart holder system: predisposed for waterproof pocket smartphone holder (sold separately). 75% polyamide and 25% polyester. 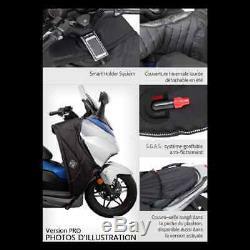 The item "scooter apron tucano r189 pro-x yamaha tmax 530 t-max sx dx 2017 covers legs" is on sale since Tuesday, December 12, 2017. It is in the category "auto, motorcycle parts, accessories \ motorcycle \ parts" \other". 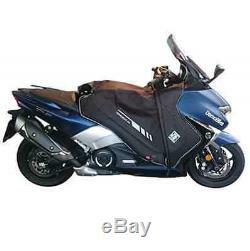 The seller is "motodak" and is located in st quentin.